Alpine Accents | Habitat | Kids VT - small people, big ideas! Skiing brought Wendy and Colin McCreight together: The couple met in 2007, while standing on a ski-gear rental line at REI in Boston. Two years later, they were married. 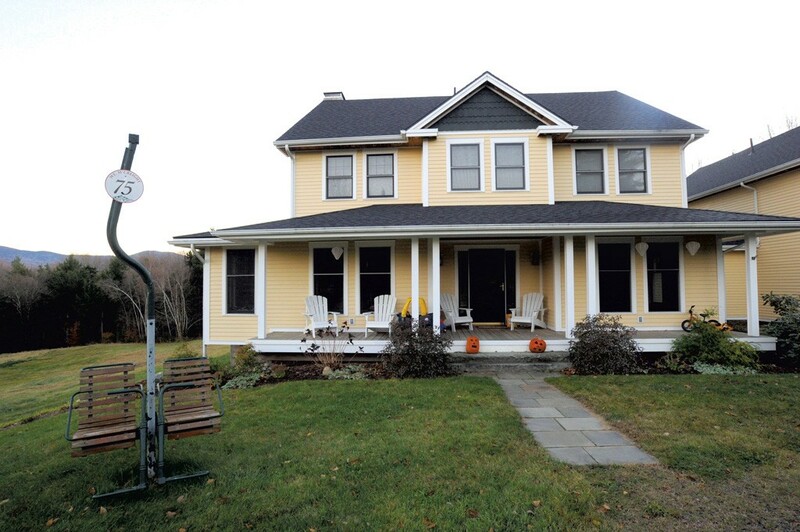 Today they live in Stowe with their two sons, 4-year-old Eli and 2-year-old Toby. A restored ski-lift chair with a sign announcing their house number sits in a grassy area between the driveway and their home, which is filled with ski-themed décor. 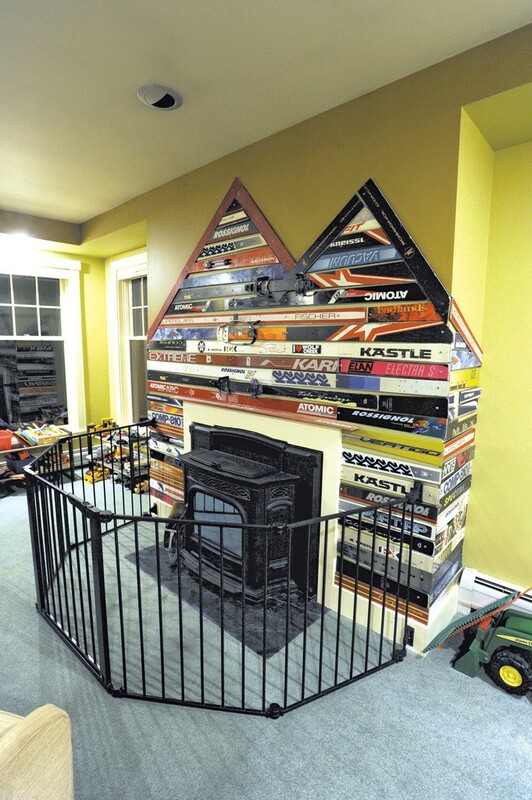 In the kids' playroom, for example, a wall behind the pellet stove is decorated with old skis. The couple procured them at consignment stores, Craigslist and the dump. With a budget of $400, they enlisted Shelburne contractor David Bertrand to figure out how to affix them to the wall in a visually appealing way. They considered lining up the skis vertically behind the stove, but didn't like the way the ski tips poked out of the wall. So Bertrand used a circular saw to cut the skis into a fun, mountain-shaped design. "He was very artsy and playful with it," Wendy explains. It took Bertrand about a week — and 25 pairs of backcountry, alpine and telemark skis — to complete the project. He sanded the sharp metal ski edges and used bolts and heavy-duty glue to secure the skis to the wall. Some still bear their Telemark bindings. As a finishing touch, Wendy added a few stickers from the family's favorite ski resorts. The final result makes the whole family happy and is durable enough to endure Eli and Toby's toy screwdrivers and hammers. "We love to ski," Eli says. "Skis are everywhere in our house!" Ventilation holes: To allow warm air from the playroom to drift upstairs, the McCreights cut three holes in the top of the wall opposite the pellet stove and positioned ski tips in the center of each hole. Mounted coatracks: In the mudroom, Colin attached two skis horizontally to the wall at kids' height and screwed metal hooks into them. 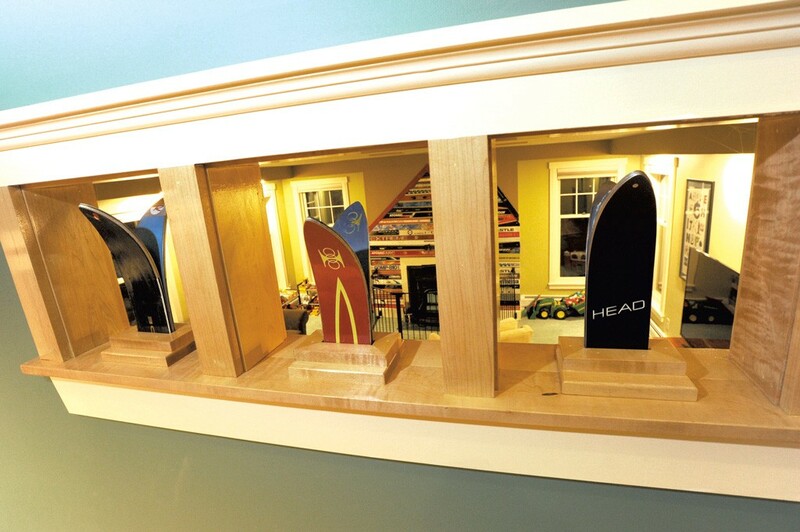 Standing coatracks: Upright cross-country skis attached to a square block make a great place for hanging hats. Colin made a smaller version using kids' skis as a gift for friends. Decorations: Three vintage wooden skis scored on Craigslist adorn the upstairs hallway.